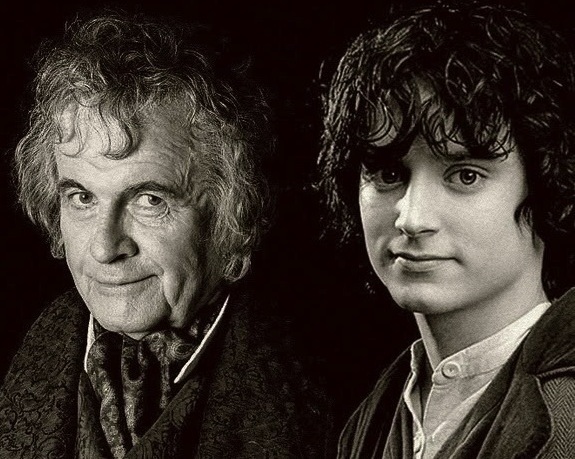 Bilbo and Frodo Baggins were both born on this day in The Shire, Middle Earth. Bilbo was born in 2890 T.A., Frodo was born in 2968 T.A.. But, when we meet him, at the beginning of The Hobbit, he is middle-aged and living a comfortable life, in his comfortable Hobbit hole (Bag End). Then in walks Gandalf and a bunch of dwarfs and all sorts of adventure, danger and even a little fun ensue. By the end of the book he has out smarted trolls, escaped dragons and found a magic ring that will change the destiny of Middle Earth. His nephew Frodo was born to respectable parents, Drogo and Primula Baggins. Sadly they died in a boating accident and Frodo was sent to live with Primula’s relatives the Brandybucks. 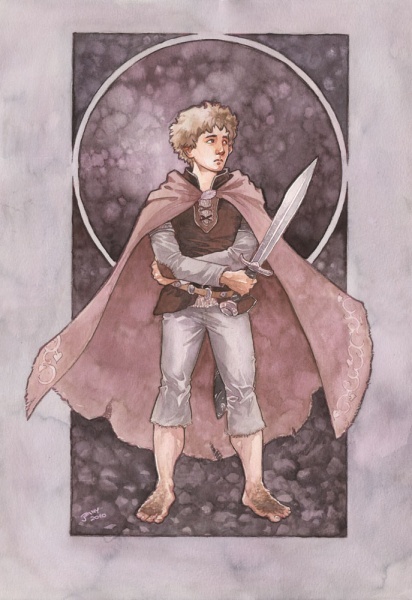 Frodo earned a reputation as a mischief-maker and eventually was taken in by his uncle Bilbo. Bilbo taught Frodo to read both Hobbit (English?) and Elvish and filled his head with tales of adventure. At the beginning of the Fellowship of the Ring Bilbo and Frodo celebrate their birthdays with a lavish party. For Bilbo it is his eleventy-first (111th). Frodo is 33. The year is 3001 T.A.. Bilbo surprises Frodo and the guest by disappearing at the end of the party. He had used his magic ring to do so. 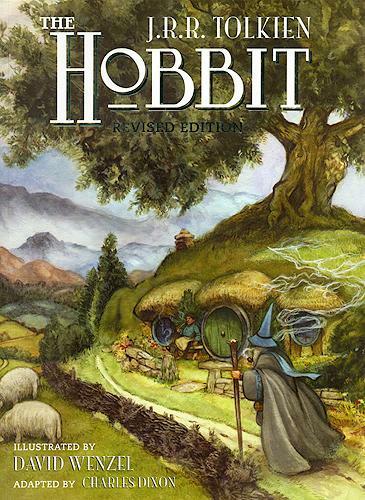 He leaves the Shire and travels to Rivendell to write his memoir, There and Back Again (aka The Hobbit) and Translations from the Elvish (which became the basis of The Silmarillion). Frodo inherited Bag End and the Ring. Gandalf advised Frodo not to use the ring but to keep it secret. The wizard then went off to discover more about the ring. 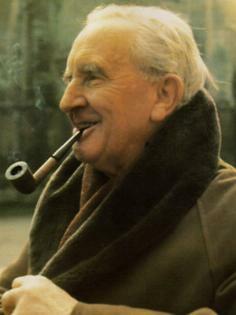 The young Hobbit heeded his advice and lived respectably for 17 years. 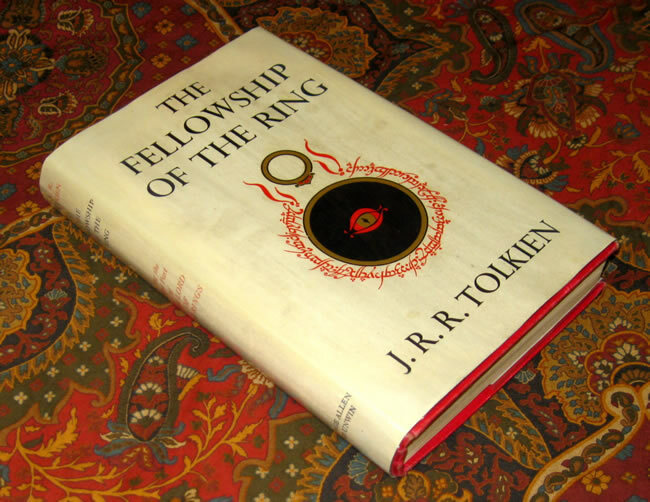 Until one night Gandalf returned to tell him the ring is the ONE RING, a thousand year old, evil ring of power that belonged to the dark lord Sauron. Sauron is now looking for the Ring and it must be destroyed. So Frodo, along with his relatives Merry and Pippin and his faithful gardener Sam head east. Later a human Ranger named Strider (aka Aragorn) joins the group. And, after some terrible encounters with Sauron’s nine Black Riders the little group makes it to Rivendell, a stronghold of Elves. There they meet up with Bilbo. The Council of Elrond is called to discuss what should be done with the ring. 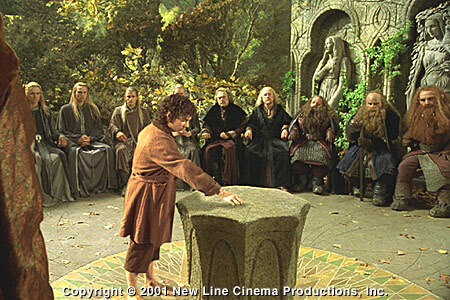 After Frodo bravely volunteers to throw the Ring into the fires of Mount Doom a fellowship of nine is formed. Frodo, Sam, Merry , Pippin, Aragorn, Gandalf, Legolas (an Elf) and Gimli (a Dwarf) set out to fight The War of the Ring. This entry was posted on Saturday, September 22nd, 2012 at 4:33 pm	and tagged with Bilbo & Frodo, Lord of the Rings, The Hobbit, Tolkien and posted in Bilbo & Frodo, JRR Tolkien, Uncategorized. You can follow any responses to this entry through the RSS 2.0 feed.